Because of innovative designers, track lighting has come so far in the decorating world. Gone are the days where you it to be hidden - let's bring on the light! Versatility is the name of the game and Globe Electric is doing it right. 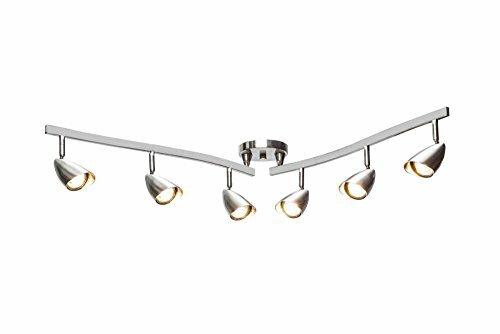 Globe Electric’s Grayson 6-Light Adjustable S-Shape Track Lighting has a brushed steel finish and a unique s-shape that brings a new look to a classic design. Each of the six track heads are independently adjustable so you can direct and focus your light where you need it the most. Ideal for use in kitchens, bedrooms, living rooms, hallways, dining rooms, this fixture allows you to point light exactly where needed without multiple light fixtures. Make your home feel liks a swanky loft or an art gallery in one easy step. Includes all mounting hardware for quick and easy installation and six 50W equivalent MR16 halogen light bulbs.